We pride ourselves on our ability to make a lawn look it’s best. 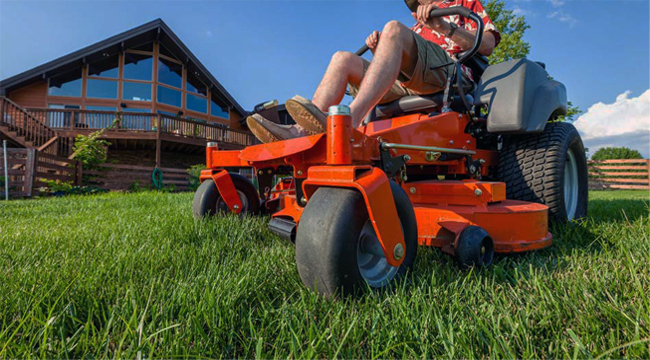 With the commercial grade mowers that we use, a perfect cut is guaranteed. There is also the option of having the grass mulched, which we highly recommend, or collected. Collected clippings can either be disposed of on your personal property or we can have them removed. In some jobs, not being noticed is a good thing, like with grass and weed trimming. No one looks at a freshly cut lawn and says “Wow look at how nice the weed trimming looks!” It just doesn’t happen. But if the grass and weeds aren’t properly taken care of the lawn looks unfinished. When the grass and weeds are properly taken care of then the lawn looks well manicured and healthy, and no one notices the weeds. The job isn’t finished until everything is cleaned-off. We use gas powered blowers to blow-off the driveway, sidewalk, and porches so that there aren’t any grass clippings left behind when we leave. Edging a sidewalk or driveway gives a lawn a crisp, well maintained look. Edging can be a once a week job or a once a season job it all depends on the size and type of your lawn and your personal preference. We have the ability to trim and shape small bushes and hedges to suit your needs. With gas powered hedge trimmers and a steady hand we carefully shape the bushes so that they receive the optimum water and sunlight. With the Spring and Fall seasons come the need to remove leaves that remain on the ground. Have you ever seen a yard in the Fall when the leaves have fallen and left for weeks. It doesn’t look nice because leaves make your lawn look unkempt, and some leaves can actually damage your grass if left unattended. So, we can collect and remove leaves, or place them in a compost pile on your property. Either way your lawn will look fresh and healthy while others look like there covered in a leaf blanket. All lawns need nutrients to survive and sometimes they need a little help to get them. All American Lawn Care Service can design several different programs to help your lawn look it’s best. We can set up and schedule several applications that continue throughout the season, or we can apply it only once or twice. Sometimes you would like some mulch or a pile of black dirt spread over the side of a hill. We have all the tools and knowledge to do any small landscaping jobs. We can make you lawn look beautiful with our mowing services and improve the appearance of your yard with our landscaping skills.